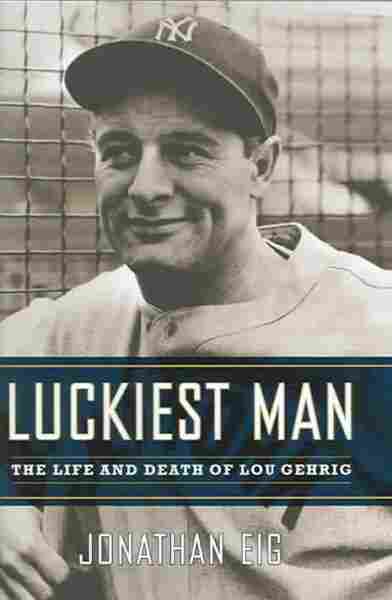 'Luckiest Man' Explores Life of Baseball's Gehrig Jonathan Eig's new book, Luckiest Man, looks at the life of New York Yankee hero Lou Gehrig, on and off the field. Gehrig was the unstoppable "Iron Horse" as he hammered home runs while playing in 2,130 straight games. But his life was cut short by the disease that now bears his name. Lou Gehrig at his retirement ceremony in Yankee Stadium, July 4, 1939. Before the player gave his famous farewell speech, emcee Sid Mercer informed the crowd that the guest of honor was too moved to speak. Jonathan Eig tells Robert Siegel about his new biography, Luckiest Man. The book looks at the life of New York Yankee hero Lou Gehrig, on and off the field. Gehrig was the unstoppable "Iron Horse" as he hammered home runs while playing in 2,130 straight games. But his life was cut short by the disease that now bears his name. Lou Gehrig stepped onto the field at Yankee Stadium wearing a pinstriped uniform that no longer fit. His pants were bunched at the waist. His jersey billowed in the wind. The crowd hushed as they watched him walk, head bowed, feet shuffling, arms hanging weakly at his sides. They had seen him make the trip from the dugout to home plate thousands of times, but never like this, never with a look of dread creasing his face. 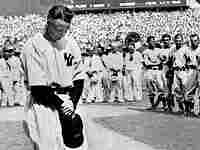 It was July 4, 1939, Lou Gehrig Appreciation Day at Yankee Stadium, a hot and sticky afternoon. For the first time in his life, Gehrig was afraid to be on a ballfield. He was thirty-six years old and dying. His Yankee teammates and their opponents that day, the Washington Senators, were lined up on the infield grass, waiting for the ceremony to begin. His wife and parents watched from box seats along the third-base line. More than 61,000 people sat elbow to elbow in the stands. 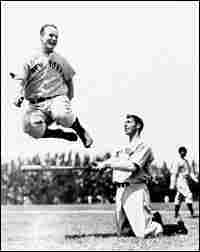 Gehrig never looked up. When he finally reached home plate, he stopped and scratched at the dirt with his feet. The master of ceremonies introduced some of the special guests in attendance, including Gehrig's former teammate Babe Ruth and New York mayor Fiorello H. La Guardia. 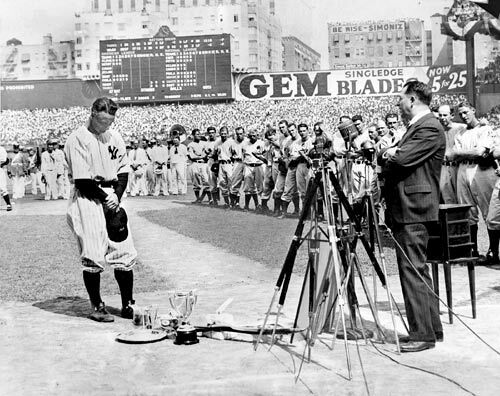 Gehrig twisted his blue cap in his hands and tottered from side to side as he listened to a series of short speeches. Next came the presentation of gifts: a fishing rod, some silver plates, a trophy with an eagle on top. He accepted them without saying a word. The crowd applauded, but only politely. 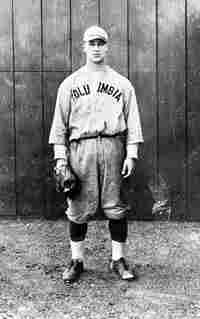 Here was Gehrig, the greatest first baseman the game had ever seen. Yet for all his accomplishments, his movie-star looks, and his gentlemanly manner, fans, somehow, had never shown overwhelming enthusiasm for him. Sportswriters said he lacked color. He was no Babe Ruth, they complained. The Babe was the Bambino, their child, and people loved him unconditionally. Gehrig's nickname -- the Iron Horse -- was inspired by a train, and it was perfectly apropos. Most people don't appreciate a train's strength and reliability until they're standing on the platform one day and it doesn't show up. When the presentations were over, the emcee, Sid Mercer, asked if the guest of honor had anything to say. Gehrig answered with a slight, almost imperceptible shake of the head, no. He was afraid he'd collapse if he tried to speak. Workers moved into position, ready to roll up the wires and pull down the microphones. Only then did it dawn on the men and women in the stands that he was going away. Cries of protest rang out. The shouting grew louder and spread like a fever through the stadium. Soon, all the fans were on their feet. Their voices came together in a chant that shook the grandstand: "We want Lou! We want Lou!" Gehrig stood still. His shoulders hung limp and heavy. At last, Joe McCarthy, manager of the Yankees, walked over and whispered in his ear. Gehrig nodded, ran his fingers through his hair, and stepped hesitantly toward home plate. The chanting stopped. Silence blanketed the stadium again. Ever so slowly, Gehrig leaned toward the microphones and drew a deep breath. He was about to deliver one of the saddest and strongest messages an American audience had ever heard.